As the new year broke over California, an air of anticipation enveloped Republicans as a new chief executive was preparing to take the reins of government and Republicans held their majorities in Congress. Even in a state where Democrats hold every constitutional office and regained super-majority status in both legislative chambers, a feeling of a new era enthused the party faithful. Today, nearly nine months into the new administration, Obamacare remains untouched, tax reform is still a “discussion point” in Congress, and the minority party seems to have their hands on the levers of power instead of the Republican majority. Meantime, while the Republican National Committee finds graceful language to describe legislative failures, California’s legislative Republicans are reduced to producing unread press releases and 140-character rants to limited social media audiences. Unfortunately, in California, with their numbers reduced in the last election, legislative Republicans seem willing to aid and abet the abuses of liberal Democrats as they enact new taxes, extend burdensome environmental programs and further abuse small businesses across the state. One only need witness the political firestorm that followed the tergiversation of 7 Assembly Republicans, including the Assembly Republican Leader in supporting Governor Brown’s Cap and Trade legislation. State Republican leadership seems deeply divided and questioning their future in an ever-bluer state. That division is best reflected in the 7 votes of the CAGOP Executive Committee members, in the name of harmony, against a resolution calling on the Assembly Republican Leader to step down (7 seems to be the Leader’s lucky number). Of course, the question not answered by board members in opposition was harmony with whom? The internal harmony of a party increasingly at war with itself or more to the point with conservatives and conservative principles? Or perhaps they mean the harmony produced by collaboration with the Democrat pursuit of more power over people, their lives, and California’s economy? Naturally, the public face of the CAGOP struggle is the oft used phrase that the party needs to improve the “brand.” Even the Assembly Republican Leader said in a recent editorial that the brand was “…in desperate need of change.” (Emphasis added.) While it’s popular to point to the “brand” whenever there’s difficulty standing by the party principles that got them elected, it begs the question of why they would embrace that “brand” in the first place. 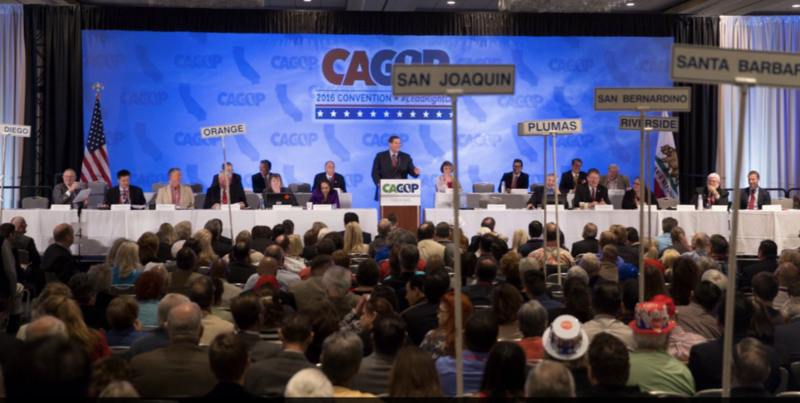 If a new direction for the CAGOP is warranted, who is responsible for it and principles that guide it? What sanction will the CAGOP impose when it comes to the wholesale disposal of basic elements of their platform? Is it party leadership or is it the purview of a “leader” with a tenuous hold on his leadership position? It’s likely those questions will be at the forefront of party members during the next state convention and well they should be for the sake of future candidates, as well as potential voters. My mother, like most would tell me, “Say what you mean and mean what you say!” It’s time for Republicans to return to those simplest of lessons. If legislators, whether in Washington, D.C. or Sacramento can embrace the “bold colors” and principles of the Republican “brand” for campaign ads, but walk away when expedient there is little hope people will value any “brand” Republicans produce. To do otherwise, they may face another 40 years in the political wilderness wondering how voters could have abandoned them as quickly as Republican leadership abandoned them.